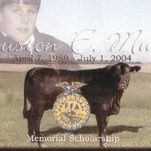 Mission Statement: The goal of this scholarship program is to recognize students in an FFA program in Marshall and the surrounding area schools. Students who receive a scholarship must use it to further their education at a two or four year college, university, technical or specialty school. Eligibility/Criteria: Secondary students must be an FFA member, a high school senior and eligible to graduate the current year for which the award is being made with a GPA of 2.0 or above on a 4.0 scale. STUDENT: After you have completed this application, present it to the Saline County Career Center Counselor for certification. The deadline is March 22nd of your graduating year. There is a portion that must be completed by Mr. Crews and Mrs. Castle. IF you want Mrs. Castle to send your application, have it to her by March 20th. Applications are available from Mr. Crews.